1.) Open GeoGebra. Click Algebra & Graphics in the Perspective panel. 2.) Follow steps 1-8 of GeoGebra Tutorial 4. 3.) To place the first line, select the Text tool and click on the vacant part of the Graphics view to display the text tool dialog box. 4.) 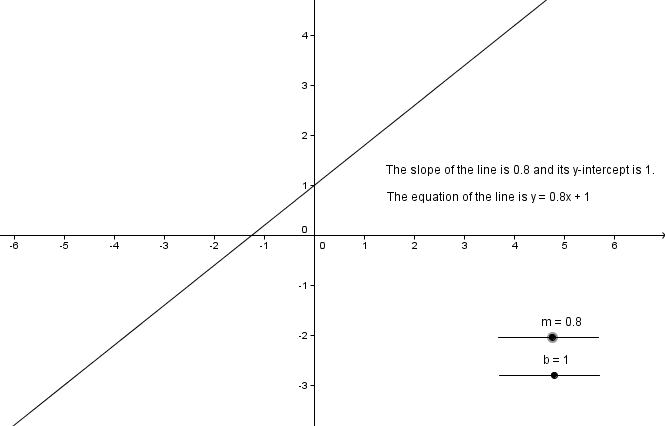 Type the following: The equation of the line is and then click the Objects drop down and select a. 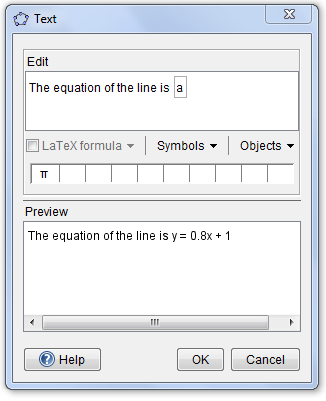 Notice that a, the name of the line is displayed in the Edit box, and it’s equation is displayed in the Preview box. 5.) To display the second line, type The slope of the line is and then select m from the Objects drop down, and then type and its y-intercept is and then click b in the Objects drop down. The blue-colored text the strings of texts whose values never change. These should be enclosed with double quotations. The variables a, b, and m, are names/values of mathematical objects in GeoGebra. It can be a number, an equation, coordinates, etc.